As we enter a new year, a new member has joined the CONIFA family: we are extremely proud to welcome Skåneland (Scania) as a member of CONIFA. Skåneland was unanimously approved by CONIFA’s Executive Committee on January 11, 2017. Skåneland is situated on the southern part of the Scandinavian peninsula. Its area covers about 21,000 sq. kilometres. The historic Scania consists of four provinces – Skåne, Halland, Blekinge (today part of Sweden) and the Island of Bornholm (today part of Denmark). The present day population of Scania is about 1.5 millions. Neither the Territory of Scania nor the Scanians have any legal status in the State of Sweden. The Scanian language is not recognised by the State and is not subjected to sufficient legal protection. 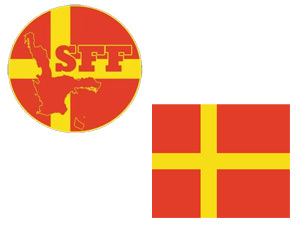 The Scanian Football Federation (abbreviated: SFF) was founded 2010. The organization became a member of the now-defunct N.F.-Board in 2011. Read more about Skåneland here. Follow our friends @CArtsakh for more news on the CONIFA https://t.co/WEhuPlu1gK European Football Cup 2019!